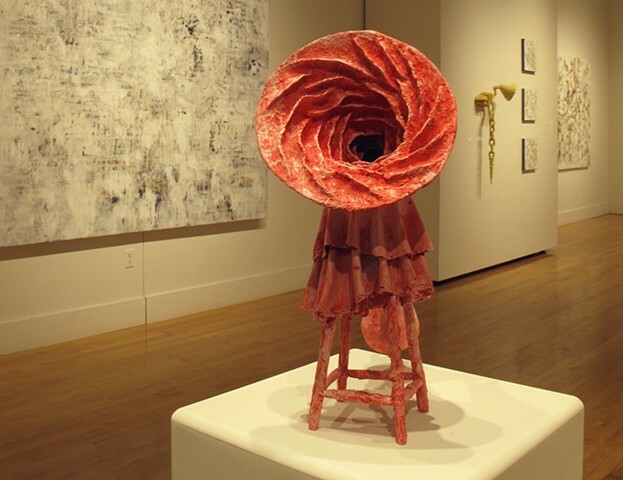 Each of my sculptural works is a bricolage of objects and forms that I have found or created from observed sources. They embody my appreciation for the allure of random formal interactions, as well as my compulsion to arrange and order. My fascination with coupling disparate forms and materials drives me to align components and develop juxtapositions which I feel are harmonious. I seek a level of involvement with materials and processes that is a dialogue, where I respond to the materials as I manipulate them. Much attention is given to the area and means of connection so that the transition is fluid, as if the coupled materials are outgrowths of each other. This resolving of differences between materials and/or objects through cooperative joining results in contradictions being built into the works. The sculptures reach for a sense of purpose at the same moment that their very makeup denies any logical functionality. They seem to have walked out of a surreal world where they are players in a story unknown to us. But still, they are comprised of materials and arrangements that are entirely of this world. I find this to be a poetic musing on the way we humans are of this world but perpetually strive to become part of someplace wholly other through our machinations and imaginings. As humans, we are organic creatures which have arisen out of our biological environment. Yet, as thinking, sentient beings we develop industrial and intellectual systems to advance our ability to survive and progress. Over our history we have struggled to find a balance between our connection to the biological “natural” world and the “unnatural” systems we create. By using this tension between hybridity and incongruity my sculptures seek to metaphorically communicate the dual nature of the human condition.